Professor. I've been following your posts and working through your classes for over a year now. You're really killing it here. Narratives are key in valuation.The numbers I come up with reflect the narrative. I sometimes like to have a couple of possible narratives for the same entity in-order for me to perform a what-if analysis. Good job that you decided to ignore the advice. You probably wouldn't be as well-known as you are now if you had gone down a more conventional route. Life is peculiar like that sometimes. A great read. Valuation seems to be numerification of narratives. Thanks professor, interesting comment about the Shark Tank show, which I have seen critisized as presenting valuation in false colors. May I suggest a blog post with your view. Disclaimer: I have no association with said show. You should really hit up Brian Gendreau at UF if you want to explore this deeper. He definitely had a similar take on narratives vs. numbers. My only response question to you is: Since relying on either narratives or numbers as an external evaluator is basing valuation on imperfect information, wouldn't it be best if instead of valuing the companies on the range of possible narratives, you instead would base it on the narrative(s) mass market psychology would be most likely to accept?i.e. wouldn't incorporating some sort of social media scan of posts + incorporating polling of an appropriate sample size + analyst basket +media articles and account for them using some sort of blackjack valuation assignment (positive words=+1, negative words= -1) be a more useful narrative in terms of true valuation than coming up with the range of narratives on your own or based on a New York Times article? Not to be antagonistic, just curious on your view of that? I think that you are mixing up pricing with valuation (see my earlier post on the distinction between the two). All of the psychological factors that you mention affect the price but they have no effect on value. There has recently been one perfect narrative story on the market when investment funds gave invested $1 bln. in junk "YO" start-up. This is perfect example to your article. Always love reading your posts Professor, I'm always learning something new and interesting from you. 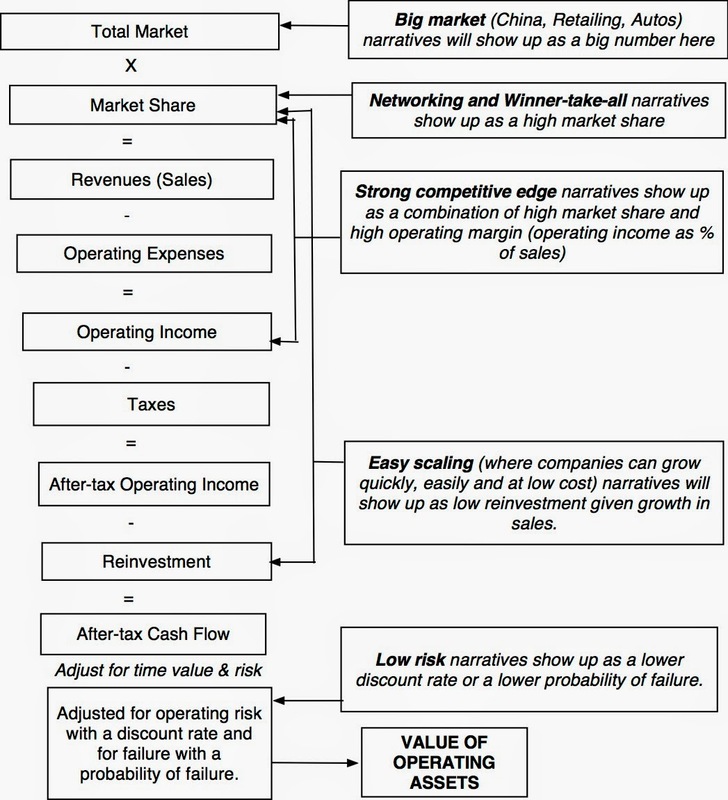 I believe the equation that revenues are the product of total market x market share is at least misleading and maybe one of the most misunderstood relation in financial science. It is simple not true that as an entrepreneur you only have to increase the market share and you are doing great. Typically, increasing your market share comes with a lower profit, either because you have to strongly invest into marketing or you are lowering your prices. It is typically the other way around: if you want to have a profitable company (and that is what you should be interested in), you should raise your prices and profits. The market share should come only as a secondary thought. Professor, in McKinsey style, your valuation was “Directionally correct”. That helps the audience to a very great extent. Matching the narratives with appropriate numbers requires significant understanding of the past, clear perception of the present, and wonderful anticipation of the future (political, economic & social) events/ market trends/ human behavior/ technological advancements. Valuation, in essence, is both a science and an art! Professor, this is a great read & an amazing experience exploring the blog. One visit is not enough, will be hanging out often. This is indeed a useful, informative & very good post. Thanks! for all the sharing. That's the fact that Human beings respond better to stories than to abstractions or numbers, and remember them for longer. Great site. Plenty of useful info here. I am sending it to several friends ans additionally sharing in delicious. And certainly, thank you in your effort! Other than "Hail Tech" Über is a asset abuse company. They promised certain incomes per ride and once trusting drivers were willing to assume the debt for a black service-level vehicle Über re-wrote the income rules. What passes for genius at Swarthmore and Wharton is just another racket on Main Street. Über and Lyft depend upon unwise drivers to assume the asset and all related costs. Their entire business model depends on others. They will never swing for driverless cars since those carrying costs will dismantle their made-of-clay model. Why does no one mention this shift in asset acquisition? Because they've never performed work like this and I'd wager no one who has used the service would dream of becoming a "small-getting-smaller-business-owner". Their model is a joke and once this experiment is over we will all understand why taxis are so expensive and why this industry is so fragmented and limited to local areas. These carrying costs are enormous and as variable as the fluctuations of insurance and energy. Remember pets.com? Who ever made money shipping 50lb bags of dog food? UPS and Fed Ex. Hey, what If they get into the ride biz? They've got the drivers and the vehicles. Just paint the trucks black and add seats...if its cheap enough people will take that ride. Goldman could take that spinoff public. They're already global and have an app for this. Uberpets.com! Thanks Prof Damodaran - this is why you are the man when it comes to the science/art of valuation. There are far too few academics who teach people to use their common sense instead of a rote textbook or theoretical approach.Numbers and jargon while intended to be helpful often end up obscuring the message or key insights. More please.